What is the perfect greeting? What’s this stuff on top? Considering the good comic strip titles that are out there, it’s not so easy to come up with definite failures right out of the gate. According to recently declassified A-files, one summer afternoon in 1947, itinerant preacher and civilian pilot, Kenneth Arbogast, was using his plane to search a remote area of the Cascade Mountains for proof of a foreign invasion. Scanning the ground, he banked his aircraft in a sweeping turn over the town of Mineral. Arnold saw a brilliant blue-white flash across his plane’s wings. Desperately looking around, Arbogast saw a tight formation of nine “peculiar-looking babies with wings.” They were far to the north of him, but they were heading in his direction—very fast. He later reported: “They didn’t fly like any aircraft I’d seen before. Maybe it would be best to describe their flight characteristics as being similar to a flock of geese.” He was certain the United States didn’t have such advanced aircraft, but what about the Soviet Union? Kenneth Arbogast was, to all outward appearances, a pillar of society. He was a successful minister at a young age and an acting deputy auxiliary police officer for Wichitaw County, Kansas. In later years, Arbogast reported several more sightings. Whatever the truth about Arbogast’s story, public reaction was amazing. Over the coming years, thousands of people have reported encounters with holy beings. 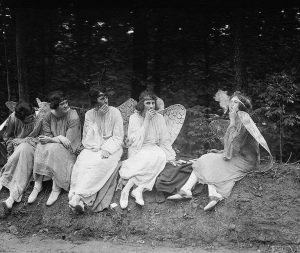 The Fifties and Sixties saw Americans moving beyond mere sightings into direct contact with angels. In the ensuing decades, reports have taken a more sinister turn. The adumbration phenomenon is an umbrella term used to describe a number of assertions stating that angelic creatures kidnap individuals. Many such encounters are described as transformative or pleasant, but others describe them as terrifying or even humiliating. Reports of angelic contact have been made from around the world and throughout history. Alleged abductions are usually closely connected to apparition reports, and are supposedly conducted by so-called cherubim: short, pale-skinned humanoids with large heads and enormous, dark eyes. It is possible that some “abductees” may be unstable types or under the influence of illegal substances. Religious beliefs are also cited as the source of angelic abduction delusions, though some commentators argue that it might be more accurate to characterize the phenomenon as a type of modern-day folk myth (like the historic belief in martians). While some experts contend the field is rife with kooks and pseudoscience, there is little doubt that many apparently sincere persons report angelic abductions they believe are utterly genuine. Stigma and self-doubt may be obstacles to more widespread study and/or reporting. Some abduction reports are quite detailed. The “terror abduction” experience is reported mainly in the USA, while in the rest of the world, particularly France, the encounters are said to be largely benevolent. An entire subculture has developed around the subject, with prayer groups and a detailed mythos explaining the reasons for abductions. Various angels (cherubim, seraphim, “Archangels” and so on) are said to have specific roles, origins, and motivations. Abduction claimants do not always attempt to explain the phenomenon, but some take independent research interest in it themselves, and explain the lack of greater awareness of Angelic Abduction as the result of either governmental or humanistic interest in cover-up. Different cases vary in detail (sometimes significantly). Some argue that there is a broad, fairly consistent sequence and description of events which make up the typical “close encounter of the angelic kind”. There are however cultural differences in perception of these reported incidents. Although in North America, guardian angels are the most commonly blamed in these incidents, in Europe and other parts of the world, they are as often perceived to be demonic in origin. The individual(s) concerned are often traveling by automobile at the time of the incident, usually at night or in the early morning hours, and usually in a rural or sparsely populated area. An angel will be seen ahead, (sometimes on the road) and the driver will either deliberately stop to investigate, or the car will stop due to apparent mechanical failure. Other forms of mechanical failure and interference are also common, such as a car radio producing static or behaving abnormally. In the occasions when they have been present, animals such as dogs usually also display a heightened fear response. Upon getting out of the vehicle, the driver and passenger(s) typically will experience a blank period and amnesia, after which they will find themselves again standing in front of their car. They very often will not consciously remember the experience. In some older cases, there were also occasional reports of abductees exhibiting symptoms consistent with nuclear radiation sickness. As noted above, the so-called cherubim, are most popularly associated with abduction reports. Again, however, this seems to be a North American paradigm best-known since the 1980s and the appearance of smoking cherubim on the cover of a Van Halen album. Most intriguing are recently declassified documents demonstrating decades of government investigation into angelic phenomenon. Moreover, government complicity in suppressing legitimate angelic research is indisputable. For unknown reasons, the Air Force focused a great deal of attention in the Los Angeles area in 1952. Could this be the rumored Great Angel Manifestation? Is it possible that the government recovered a live angel? More recently, some in the angelogical community have suggested that the government has used holy technology to advance U.S. goals. How else to explain Stealth aircraft, Ipods, or those cool new computerized voting booths? Some have even suggested that it is not too far a leap to believe that angels sit in on meetings at the highest levels of American government and business. Members of the White House and Capitol may even have been abducted by angels and subjected to revelations.